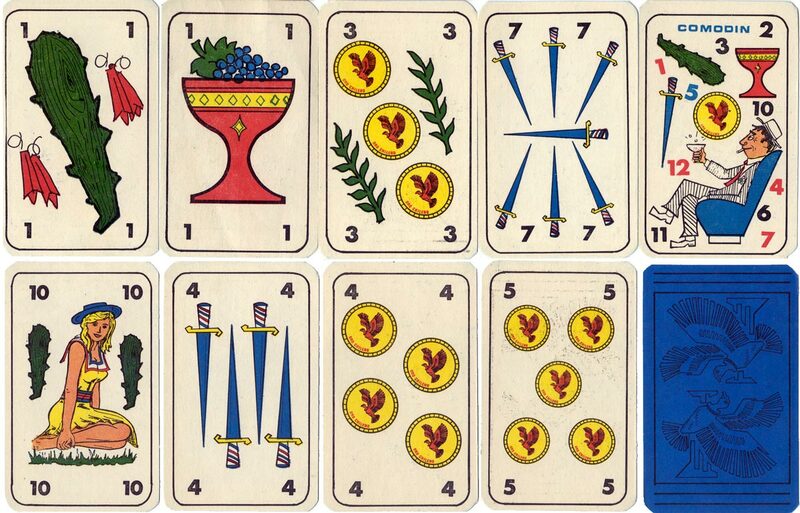 Above: cards from "Naipes Condor" Chilean playing cards, with Chilean symbolism on the suit signs. The ace of coins shows the condor on the central coin, with Chilean flags draped either side. The ace of batons is decorated with Copihue flowers, Chile's national flower. The caballeros depict Huasos, Chile's traditional horsemen of the pampas. The same figures are repeated on the court cards in each suit. The reverse shows a stylised drawing of a condor. 40 cards + 2 jokers in box.